Note Anytime is so much more than just a simple note taker like other apps. For business users, Note Anytime is a perfect combination of a note taking and sketching app combined with a virtual whiteboard for drawing and writing around any data. One power user is a gentleman namedChris Andrews who is a Financial Planner in Menlo Park, California. He was so enthusiastic about Note Anytime, that he asked our team to sit down and interview him for a product testimonial. See below how this one business user finds the infinite workspace in Note Anytimeto help him get the competitive edge with his customers. Q: How long have you been using Note Anytime? I downloaded it a couple months ago, but I also learned about it and played around with it when Mr. and Mrs. Ukigawa , MetaMoJi’s founders were in a town a couple months ago. So I am very familiar with the technology. 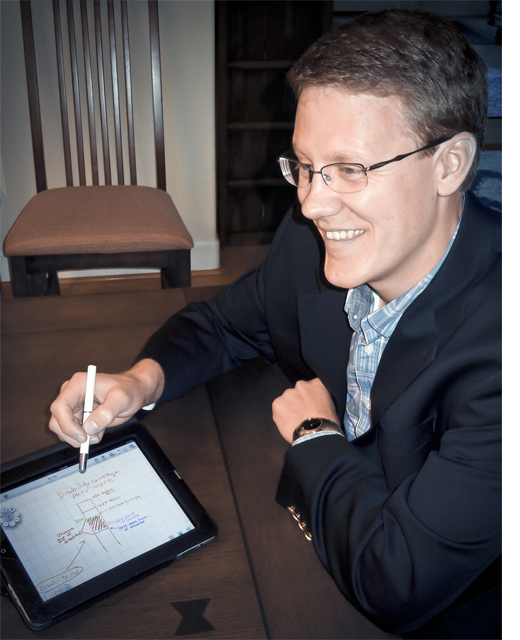 Note Anytime is really well suited for what I do for business. Q: What kind of use or scenario do you find the product most useful for? I do Financial Planning for a firm in the Silicon Valley of California. A lot of what is difficult about financial planning is expressing fairly complex ideas or taking what may feel like a complex situation for customers, and boiling it down to something that is simple, manageable and something you can work with to help clients feel in control. When I am sitting listening to clients, I am taking notes and drawing sketches on my iPad in Note Anytime. They may have all of these different accounts in different places, but they don’t usually have an overarching strategy. A lot of times they don’t know how to plan toward where they want to go. So my goal as their financial planner is to help them do so. I want to structure the meeting to make things are organized as possible so that I can help them achieve their objectives. 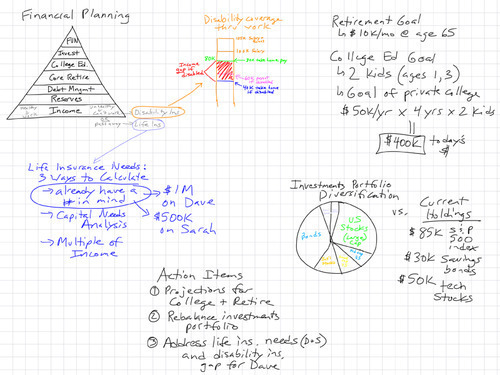 The way I use Note Anytime primarily is to diagram how I do financial planning around their different accounts. I do a lot of sketching and note taking at the same time. Sketching it freehand is really important for what I do. It’s not something I can do on a laptop or a desktop or other things. A lot of what I write during meetings is explanations of how I do business and how their accounts will fit together. It is a central part of the first fifteen minutes of the meeting and it really sets the pace for account management. I use MetaMoJi’s stylus – the Su-Pen which is super-nice, actually. The cloth tip on the Su-Pen makes it easy to draw and I love the calligraphy pen function to correct my chicken scratch handwriting! What I love about working in Note Anytime is how “zoomable” it is. I can start the meeting up in the upper left hand corner of the page and diagram out some ideas, and then continue to zoom out and add more drawings and I can always find my place. I use the paper style for gridlines from within the app and that makes it easy to add drawings in different spaces of the grid. What I love is that all of my work is on the same worksheet, instead of spread out across different pages that are not coordinated. When it comes to actual confidential client data, I have to work on the internal server in software approved by the company. So I don’t use Note Anytime for actual client data itself, but I draw sketches and diagrams on the iPad in real time to keep the meeting on track. It sets the pace and the agenda for the meeting and it keeps everyone literally on the same page as we move the meeting along. I really like that I have one big canvas to work on, as opposed to having to think linearly. I can come back and use the drawing as a reference point for any part of the discussion. Note Anytime is a free space to work as the discussion moves along. Q: So Note Anytime is like a virtual whiteboard for you? That is a great way to put it actually. I think having a blank slate whiteboard is my favorite part. But also, the drawing functions are really easy to use and intuitive – so I like that I can switch between different colors and thicknesses of pens. As I mentioned, I like that the calligraphy pen corrects my illegible handwriting. All of the tools floating around make it easy to navigate and find what you want, but especially the graph paper from the paper styles. I can always zoom out and find out where I am on the page. Q: That’s a great idea because the squares in the graph can be zoomed in and out too. Well that is what I use it for. I can fit my entire sketch in one square of the paper if I want to and zoom out and in in high resolution. It’s amazing because you have this whiteboard and it can become immense if you want it to. So I can make a drawing that scales up to several feet in size if I need to, I never run out of space. There is no limit to the amount of information I can capture, but I can also save and share it. It helps me keep track because I can just zoom in and out and drag over to the next whitespace. Note Anytime on the iPad is the most intuitive for me. I love that I can be working with my client in real time within Note Anytime and then I before they leave the meeting, I can save everything in PDF and email it to them right then and there. I will wrap up the meeting saying, “I hope this was helpful, and you probably will want to remember what we have drawn out here, so let me send it to you”. I not only send it directly to the client, but also my assistant and she can already get started on helping them with their needs. It also makes it easy for my recordkeeping because I never lose the train of my discussion with different clients. It is an instantaneous way to save notes of any of my discussions. So I always know what I talked about, which priorities are most important to my clients and what the follow up should be and the client can have that as a reference too. Q: Do you also find yourself bringing in PDF documents for clients to sign while you are in the meeting? That’s a good question, but we don’t use it for that because of rules of our compliance agreement. Rarely do I have clients sign up on things any more, my assistant does that – but that would a hugely useful if we could make it happen. I have my team follow up with implementation. I am a huge fan of Note Anytime. I am usually really a pen and paper guy, but in the last couple months Note Anytime has become my exclusive tool for these kinds of meetings. Customers will say, “That is really cool that you are able to do that on an iPad” – because they haven’t seen that experience on an iPad. So using Note Anytime has become a way that I can differentiate with my customers. I’ve also used Note Anytime internally drawing org charts to explain to new hires how the company functions and Note Anytime has been a very useful tool to describe workflow to help new employees more quickly integrate. It really is a versatile app for all kinds of situations. For creative types, they have a limitless design space to work in and share creative stuff and for the business types – they can incorporate in meetings and leave the paper and pen behind.